Almost all of us will have an ambition which leads to definite and a focused path. It varies from person to person. It is always dependent on the choice and interests that one would like to become. It also gives the meaning and purpose of life. It helps people to manage their knowledge and skills as to become experts in it. So, candidate must take time before answering the question. There are many questions that employers ask, just to determine whether the future career goals are matching with the goals of the company. Moreover employers will be impressed if they know that the candidate has future goals planned for himself. This is one of the trait of a perfect employee. Some of the questions which employers ask are. What ar your short term and long term goals? 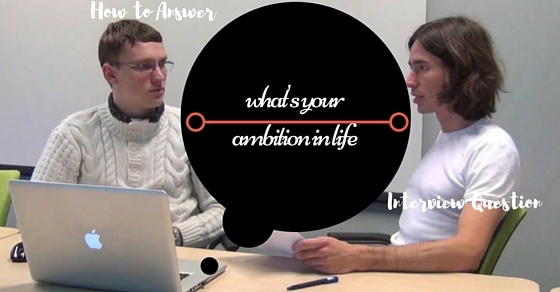 There are many other questions too and out of them one of the important one is “What is your ambition in life ” interview question. You should always see that, your aims and ambitions should focus and match with the company’s goals. This helps you achieve your goals and also will be beneficial for the company too. So, it is very vital to first know the company goals of the company. For this before coming for an interview, you should do smart reserach about the company. It helps you have an idea about the company’s culture and goals. With the help of this you can easily craft your answers accordingly. Having an ambiltion in life is one of the motivating factor of life. It adds, meaning to our life and also help us achieve success. This is the type of ambition in which the individual values himself or get motivated with the number of awards , rewards, fame money he gets for his work. Here the work is driven by ones desires. This is th”e type of ambition in which the individual purely focuses on his goals and the desires to create something unique. Here the work is proven by their own ability. In today’s competitive world the employers are trying to find some mistakes in the candidate as not to recruit them. So the individuals are just unfairly eliminated and also the contention cannot happen as to ensure that this is a dream job for a person. The employer usually waits for a person who truly excites him/her. It may depend on the candidate’s career path, tireless working and sometimes focused activities and achievements. 2. What Should be the Answer? During the interview, one should be clear enough while giving answers. This is done to ensure that the answers are perfect. The candidates can give their answer in a fairly general manner. It is defined more on a typical career path. If the answer is so much elaborated then one may forget it. So it is advisable to be specific while answering and also the candidate should be truthful. Candidate must answer in such a way that the answer given does not create a fake image in the minds of the employer. If there is any “job hopping” in the resume then the candidate can highlight it while explaining about the career goal. There must be some honest intention towards the long term goals. Anyways nobody can predict how the company will be after few years. Either it may achieve its targets with a huge amount of profit or there may be some issues that the company will face loss. Since the organization is going to invest their considerable time, money and energy in hiring and training people, it has to be valuable. The candidate must show honest intention towards the company to sustain for a long time with a good investment. The next step towards the job is more experienced and more excited. The candidates are expected to explain their enthusiasm towards the position. And the candidate must be eager to learn new technologies and concepts smartly. As all the growing companies will like the candidates those who are ready to take new challenges and must try to accomplish new goals. Usually, people with ambition are so much focused and have plans to succeed. They must focus on their hardworking rather than hardly working to achieve it. People will try to get rid of frustrations that are the obstacles to achieving their goals. Through control along with self-discipline, one can achieve their goals. The company expects a reasonable and determined way to make people focus on the path without being weaker and disappointed. The organizations will see for a person who has the job that satisfies their passion. This helps them to utilize the candidate with their innovative ideas for their complete employment. For example: If a candidate has his/her passion as a programmer then this will be applicable for them in most of the development or product based companies. It really fits in the team that is managed with the delivered results. Rather than explaining the reasons for hiring, it would be better if the candidate shows a track of records regarding their achievements. Sometimes even the logic goes if the candidate shows his successful achievements in the previous companies in the same field. It has the background and stressful environment, as the action of the position results in job and career. Ambition depends on the experience and also the new achievements that are demanded from the new positions. As ambitions are fixed, the candidate must keep track of the ways and manage the time to achieve it. It can be achieved step by step as to define what must be done to help or obtain it by an individual. This time, management will help in designing the goal in a smarter way. Everyone including the hiring manager will try to listen to the productive ways that are undertaken to achieve the goal. 3. How to Answer the Question? The interviewer will not be ready to ask questions to the candidate that are time-consuming. If the interviewer does not want to spend time with the person then he/she should be aware of how to answer the questions. If the HR seriously hires the candidate then he/she will be her boss who can see their real faces. Here are some tips to answer the question about ambition. Before attending the interview the candidate must collect ideas about the process of the company. It is defined within the merger as to do a relevant study about the company. It mediates to the website that bares the opened ideas. Ambitions are to be set initially with clear focus as to achieve it as early as possible. This question is asked as to ensure that the employer wants to make sure that the candidate will not move somewhere at least for a certain period. The candidate can share their plan about the future. It is modulated within the designed planning strategy. The candidate must be aware of what exactly is required and how to be the best candidate for that position. It modulates upon the defined goals and is job oriented within the detailed research systems. It is modified when the given situation is made convenient as to somebody ruining the detailed process. It modulates the research through firm as the answer should be strong. It pertains the job description and the duties to enjoy it. Each company has different policies and individual responsibilities. The ambition should be achievable within the desired time period and with the expense. It manages the rules and responsibilities of the desired impression that is left in the course of the interview process. It modulates the defined and suited impression within the little things that are added up to the consequences of the different contacts. The candidate must not try to overreact as to define the necessity of job. It has more importance as a professional overboard and is defined more to be on the personality as a line of the manager. The defined roles and modified demands are equally important for all. Goals should be fixed and should not be over boarding. The paths taken to achieve the goal have to be aligned as to make sure that their companions are made to determine the jobs right away. If the goals are matched with a sequential manner then it can be estimated and organized instead of being idle. By using the phrase “Points to emphasize” the candidate can make sure that the goal setting and following paths are clearly explained. It means to connect with the employer and is focused on detailed search. Being honest while explaining will add to the points. It manages the serialized and defined way of all the fit and current learning of the ideas that are defined and elaborated. It manages the learning and interest among every person in the team. It dramatizes the preparedness for all the goals that are achievable. The level of expectation of the employer should match with the significance of goals. Do not make the level to go back. After getting a question the candidate must answer it in such a way that he/she has more contribution to the organization. This is relating the goal with the employer to achieve certain results. It depends on the ambition that is also related to the progress and growth of the company. It has some solid performance about the detailed information to be carried as a part of the plan prepared. It is mainly done to observe about the self-awareness of the candidate. Answers can be drafted in advance as to modulate the resourceful idea. It manages the appropriate statements that are serialized into the progressive performance of all the challenging things. It manages a secure position in a customized way as to create a particular objective. It matches with the priorities of all paths that are set to achieve. One must focus on the desired results and it has to be broader for a definite goal. It can be a long-term aspiration that they can be mid-career goals that are modulated within the major goal. While being focused, the candidate may think of all the roles that are stimulated within the focused picture. Employers will place their demand on each and every basis that is more bypassed within the fear of the candidate as to bring all the defined goals. This question is taken as a behavioral question that has to be answered in such a way that all the interviewers will focus on the confidence level of the candidate. 5. How not to Answer? If the employer is ready to listen then the candidate must express their ideas that are productive and also more focused on certain things. It depends on the mindset of the employer. If the interviewer is asking about the ambition in life then just try to explain as per the resume. Don’t try to give some lame excuses which the interviewer may not come across. Depending on the question the candidate must answer and must not panic during the course of the interview. The employer will not hire the candidate based on the accuracy of the answer but he/she will hire based upon the confidence and also upon the truth. Before switching over to next question, the candidate must reassure about the willingness to work in the present career path. The answer should not be started by saying “It is too tough”. This will leave a bad impression on the candidate. Being too specific will sometimes be more unrealistic. Even if ambitions and goals are specific, it should be realistic and achievable in the available job. Thus, the interviewer will suggest that the person is not fit for that position. Almost all the criteria have to match with the defined goals. The goals are valuable and are more competitive. It defines the valuable skills that are matched with the certain skills in the job description. It moderates to the growth of the company. Each interview question will be behaviorally challenged. This question about ambition has to answer very carefully as to ensure the employer is satisfied and will hire the candidate. The answer has to be clear and perfect with a proper statement as to get the job. One cannot lead an unplanned life and has to be prepared.